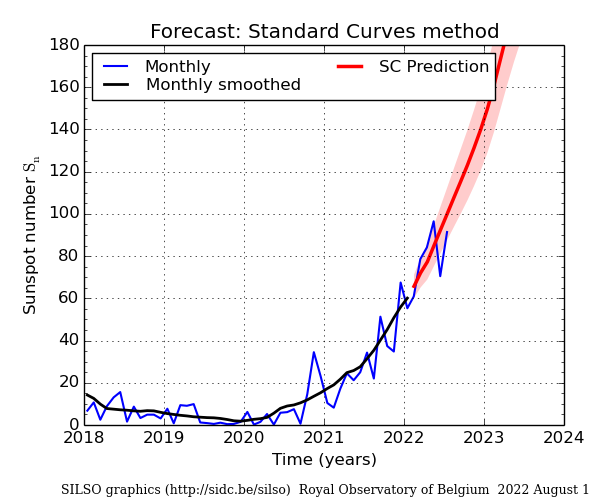 Forecasts of the monthly mean sunspot number using the Standard Curve method (extension of the original method by M.Waldmeier). The method consists in the least-square fit and interpolation of a set of standard curves, each curve corresponding to the average shape of solar cycles of a narrow range of maximum value. The fit is done on the observed 13-month smoothed monthly sunspot number, using the last 24 available values. This is why the prediction actually starts 5 months before the last elapsed month and runs over 18 months (up to 12 months ahead). This method performs well in the middle of each cycle, but as all methods based purely on past solar activity, it becomes unreliable at the end of each cycle and during the minima.